Event details are reproduced below. But see the Kopernik website for all of the event information! Featuring NASA Scientist Michelle Thaller! 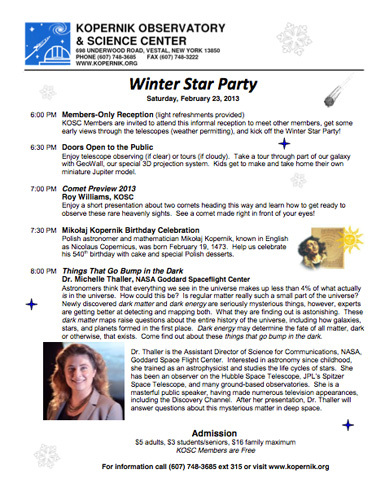 KOSC Members are invited to attend this informal reception to meet other members, get some early views through the telescopes (weather permitting), and kick off the Winter Star Party! Enjoy telescope observing (if clear) or tours (if cloudy). Take a tour through part of our galaxy with GeoWall, our special 3D projection system. Kids get to make and take home their own miniature Jupiter model. Roy Williams, KOSC – Enjoy a short presentation about two comets heading this way and learn how to get ready to observe these rare heavenly sights. See a comet made right in front of your eyes! Polish astronomer and mathematician Mikolaj Kopernik, known in English as Nicolaus Copernicus, was born February 19, 1473. Help us celebrate his 540th birthday with cake and special Polish desserts. Dr. Michelle Thaller, NASA Goddard Spaceflight Center – Astronomers think that everything we see in the universe makes up less than 4% of what actually is in the universe. How could this be? Is regular matter really such a small part of the universe? Newly discovered dark matter and dark energy are seriously mysterious things, however, experts are getting better at detecting and mapping both. What they are finding out is astonishing. These dark matter maps raise questions about the entire history of the universe, including how galaxies, stars, and planets formed in the first place. Dark energy may determine the fate of all matter, dark or otherwise, that exists. Come find out about these things that go bump in the dark!